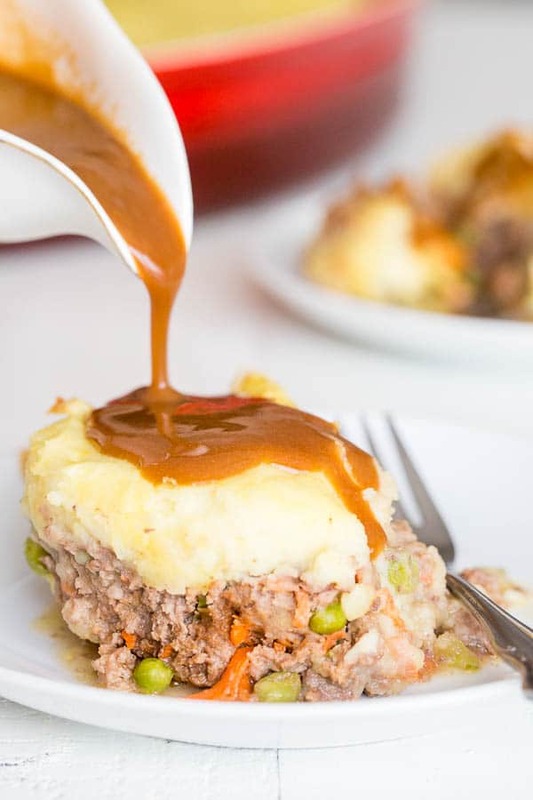 This easy shepherd’s pie will hit the spot just right when you’re craving stick to your ribs comfort food! Unlike most recipes, you don’t need to pre-cook meat filling. Super easy! I’m a meat-and-potato kind of girl all the way! Steak and mashed potatoes are my favorite food to order! Bacon and hash (and eggs, obvi!) is my go-to breakfast. And I practically grew up on this Shepherd’s pie. Yeah, I’ve had this dish my whole life, but I never knew it was an English meal! Go figure. Well anyway, my version of Shepherd’s pie is cooked a little different. But I promise you, it’s delicious! And oh so easy, you’ll be making it again and again. 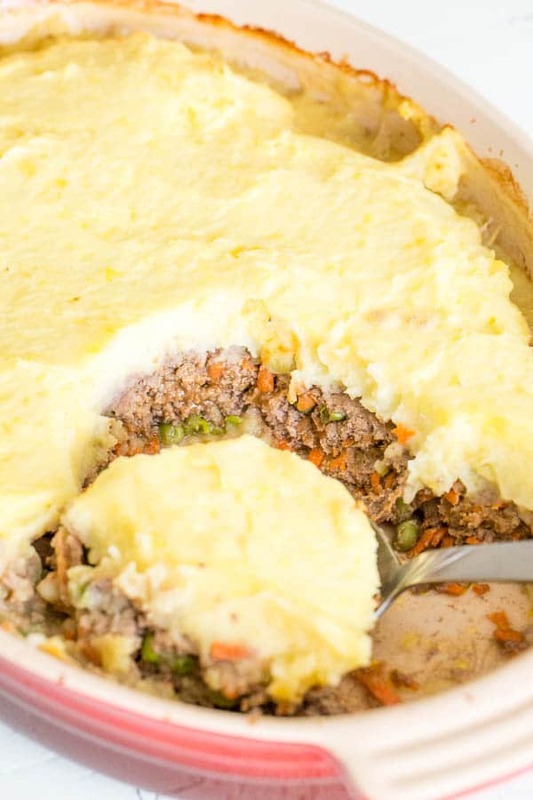 By the way, technically, this’s called cottage pie, because we’re using ground beef. 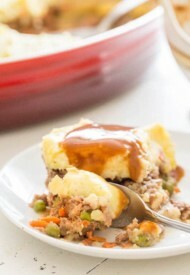 From a quick research, I learned that original shepherd’s pie uses lamb. Back home in Mongolia, my mom used to make this with mutton. Now that I think of it, she was actually making a true version of shepherd’s pie. The best part about this recipe is that it’s highly customizable! Make it once as is, and see what kind of tweaks you’d want to make next time. (And you’ll definitely want to make it again!) You can add more vegetables, or use leftover mashed potatoes (you’ll need about 4-5 cups of it), or add different spices, the choice is yours. To make mashed potatoes, cut the potatoes into medium chunks. Put the potatoes into a large pot and add water enough to cover the potatoes. Add salt and bring it to boil over medium high heat. Cook until potatoes are soft, about 15 minutes. Reserve about 1 cup of water, and drain the potatoes. While potatoes are cooking, finely chop celery and grate carrots on large box grater. In a large mixing bowl, combine ground beef, grated carrots, chopped celery, frozen peas, Worcestershire sauce and salt. Mix until well combined. Transfer the meat mixture into 9×13-inch (23x33cm) baking dish and spread it evenly. Add the mashed potatoes over the meat mixture and spread it evenly. To make the gravy, melt butter over medium heat. Add flour and whisk continuously until the mixture forms into a ball, about 2 minutes. Be careful not to burn the mixture. This’s called roux, which thickens the gravy. Slowly add beef broth into the roux and cook until nice and thick, stirring constantly. Salt and pepper to taste. 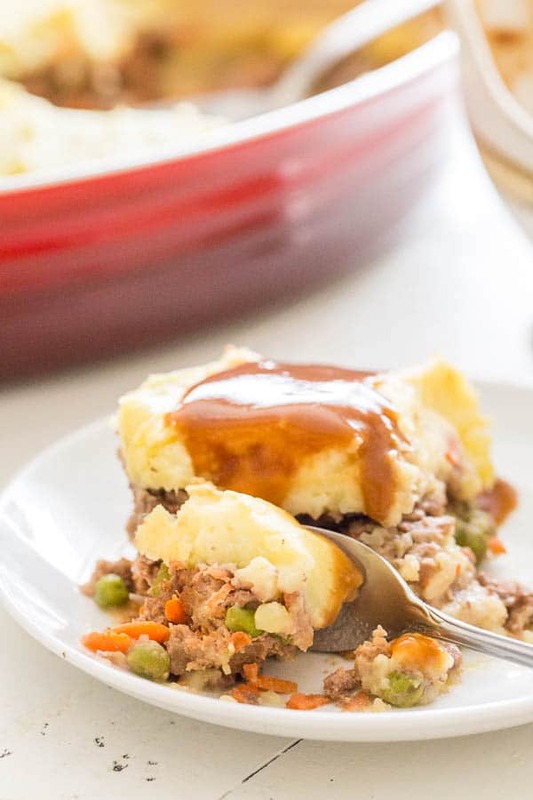 Serve the shepherd’s pie with gravy on the side. This recipe was originally published on March 10th, 2014.